With a new contract unlikely to be offered by Premier League Swansea City this summer, young Welsh defender Daniel Alfei will be hoping to play his way into a long term future at Mansfield Town. The 23-year-old former Welsh U21 right back, without a first team game anywhere all season so far, yesterday arrived at One Call Stadium on loan for the rest of the season. He has four senior appearances under his belt for the Swans, though none in the Premier League, and the last dating back to 2011. However, since then he has enjoyed League Two experience on loan for Portsmouth two years ago and Northampton Town last season. So it wasn’t a hard decision to say yes when Stags boss Adam Murray asked him to join Mansfield, following the departure of right back Nicky Hunt to Leyton Orient. “It was an easy one for me,” said Alfei. “The team is doing well, the club is doing well as whole and they are looking to further themselves, especially by being in the play-offs. “Now they are here they want to kick on and see how far they can take it. For me to be playing in the League and at a club that could easily be challenging for promotion is great for myself, personally. 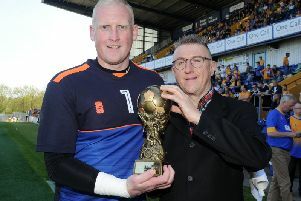 “I need to be playing at a decent club, which I feel Mansfield are. So it wasn’t a hard decision for me when it came about and it didn’t take me long to decide I wanted to come here and play. “It’s been a frustrating season. I haven’t been playing as much as I’d like to. Obviously with a club like Swansea it’s hard to get into the side or in and around the team. “So for me it’s been quite frustrating and this is something I’d been relishing and looking for. I am looking forward to getting started. How close to a first team call had he been this season? “Not as close as I’d like to be,” he said. “It’s a tough environment to be pushing for your place with a lot of players coming in and an lot of movement, especially with managers and things like that. It’s hard to push yourself into the light there. “The important thing for me this season is getting out and playing football. “I’ve had a couple of spells the last two seasons now where I’ve played in League Two. “I enjoy playing here. It’s another opportunity at a different club and I’m looking forward to getting some games. “My past loans got me my game time that I needed and it put me in the shop window. As a player, fans can expect to see him getting forward as often as he can – and he’d like to find himself contributing to the scoresheet if possible too. He said: “I like to get forward as a full back. I think you need that in your arsenal now. I see myself as quite an attacking full back. “Obviously defending is the main thing as a defender, but Id like to think I can get some assists and maybe add some goals. As much as I can bring to the team, I will try. But my main objective as a defender is clean sheets. “I sat and had a chat with the gaffer this morning. He’s just said they are going to welcome me to the team and get me used to the team and the way they play. He added: “I want to play as many games that are left this season as I can. Obviously I will set personal targets of clean sheets, assists and goals, but it is an overall target of getting points and trying to stay as high as we can in the table. Although Swansea and Mansfield are worlds apart in many ways, as a player, Alfei says it’s not a culture shock at all to drop down the levels. “There’s no that much difference,” he said. “Obviously the facilities may differ, but in terms of the way things are done it’s pretty similar. “There’s a lot of games in the Premiership and there’s a lot of games, even more so, here with Tuesday night games. In terms of the way things are run, there’s not that much difference. Alfei made his professional debut for home town club Swansea City in January 2011 in a 4–0 victory against Colchester United in the FA Cup, where he was named man of the match. The youngster made his League debut a week later, as an 88th-minute substitute against Crystal Palace in the Championship. A second FA Cup tie appearance followed that month as the Swans lost 2-1 at home to Leyton Orient. Alfei also played the whole of Swansea’ FA Cup fourth round tie against Leyton Orient in 2011/12 and signed a new three-year contract in April 2011. On transfer deadline day in January 2012 he signed for Conference National side Wrexham on a season long loan. He returned to Swansea at the end of the season, but in October 2012 re-joined Wrexham on loan until January 2013, eventually extending it to the end of the season when he signed a new contract with Swansea until June 2016. In January 2014, Alfei joined League Two Portsmouth on loan for one month, including a home outing against Mansfield, and that loan was also extended until the end of the season. That summer he agreed to go to League Two Northampton Town on a season long loan, playing in the opening day home game against the Stags. However, he had only made 14 appearances there before his loan was terminated on January 2 2015. Click HERE to see video of Alfei talking about joining Northampton. Click HERE to see a video of Northampton boss Chris Wilder talking about signing Alfei. After playing for Wales U17s and captaining their U19s, he went on to play 13 times for the Welsh U21s, scoring twice. Stags boss Murray said: “He is intelligent, an excellent footballer and will bring good qualities to our defence and will give us a good attacking balance heading forward.